Most often the texts have to type and print in Word text processor and spreadsheet editor Excel of the office package Microsoft Office programs. Rotate the text to vertical for the whole document or some of its fragment in these applications a variety of ways, several of which are listed below. If you print in vertical have a page of text, then you can simply change the orientation of the sheets from portrait to landscape. In a word processor Microsoft Office Word to do this, go to menu tab "page Layout" group of commands "page setup" to open the drop-down list of "Orientation" and select Landscape. You can then send a document to print by opening the corresponding dialog by pressing ctrl + p. Similarly, this is done in the spreadsheet editor Microsoft Excel. If you print on a vertical it is necessary the text in the table cell in Excel, first enter the text in the usual way, and then expand the dropdown list of the "Orientation" group of teams "Alignment" tab on the "Home" menu. In this list of seven items, three of which offer different printing methods in the vertical. This way you can vertically Orient the text in a single cell, but also any selected groups. In the cells of tables in Word documents for similar text rotation in cells it is necessary to highlight the desired cell, then click the right mouse button and select "text Direction" from the context menu. In the opened window will have two options for vertical text orientation. In a word processor Microsoft Word there is another possibility to print at the vertical part of the text of the document. To do this, go to the "Insert" menu and then under commands Text" to reveal the drop-down list Label. Select one of the options, and Word will create the document object, which you can change. In addition, the menu will add an additional tab "Work with the words: the Format - the program will switch to that immediately after the creation of the label. Click "text Direction" in the group of the commands Text and content labels will rotate 90° clockwise - so you get vertical text with the top down. Clicking it twice you can change direction too the vertical but opposite in direction. 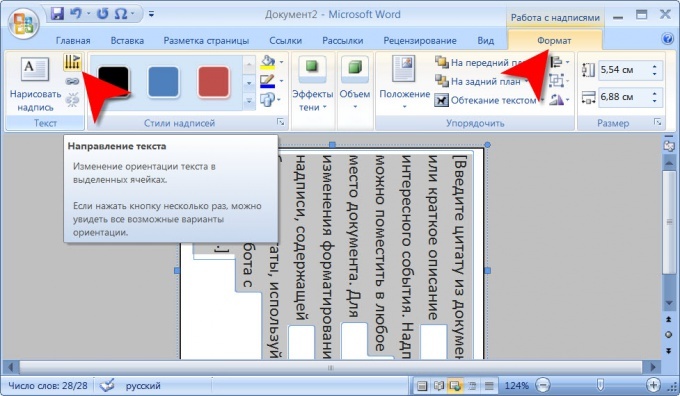 In WORD, a situation arises when you need to write vertically in word. In order to make the document, the vertical text, use the insert table. In the Ribbon, in the Insert tab, click table and insert the required number of cells. Click OK.
Click on “Draw label. Make a field in a Word document. To the left you will see a button to set text direction. Among other things, it is possible to specify vertical writing in MS word. First we need to create a table. You can do this by clicking on the menu "table" and then selecting the "Draw table". Inside the cells, write the text you want to flip. After selecting the text, hit Format - text Direction". In the opened window you can select the direction of the three options. To save changes, click "OK". If you need to remove the table border, then make it pretty easy. Just right click on one of the four borders of the cell, then select the "Border and fill". In the tab "Border" you can remove all or multiple side lines, change their color and width. Change text direction in this version is even easier. First also need to create a table and enter the text. After that, select the text and click the right mouse button on it, select "text Direction". There are cases when the text in the document you want to place the not quite standard way, for example, to rotate it vertically. In Microsoft Office Word you can use for this purpose existing instruments. If you do not want to format the text, you can use a ready template. Click on the Office button in the upper left corner of the window and select the context menu item "Create". In the left part of the window that opens, choose a template in which the text is rotated in the desired direction. Click on the "Create" button in the lower right corner of the window and enter in the template the text that you need. To manually set the text direction, click in the editor window on the tab "Insert". In the section "Text" click on "Inscription". In the drop-down menu, select one of the thumbnails, or select "Draw" inscription. The cursor will change its appearance. Hold down the left mouse button, mark the boundaries of the future of the inscription, and then just release the mouse button and position the cursor in the newly created region. Type your text in the same way as usual. While the mouse cursor is located within the boundaries drawn, the editor has a context menu "Work with words". Activate the Format tab, scroll to "Text". Click on the "text Direction" until then, until the label you entered will not be taking the right direction. To move a field with the inscription in another part of the document, move the cursor to one of the corners of the form. 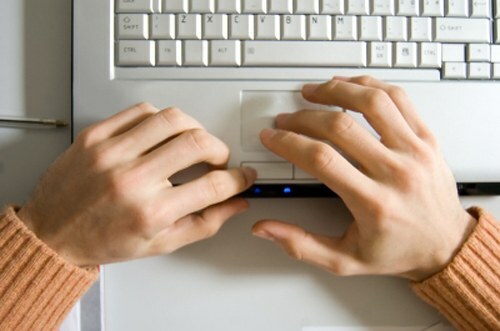 When the cursor changes to a double-sided arrows, hold the left mouse button and drag the form. Determine the label position on the page, hide the border of the shape. In the context menu "Working with labels" on the Format tab, find the "label Styles". Click "shape Outline" and select from the dropdown menu to "loop". By the same token, it is possible to place text in a table cell and turn it in the right direction. Open the "Insert" tab, under "table" click on the corresponding button and select from context menu "Draw table". 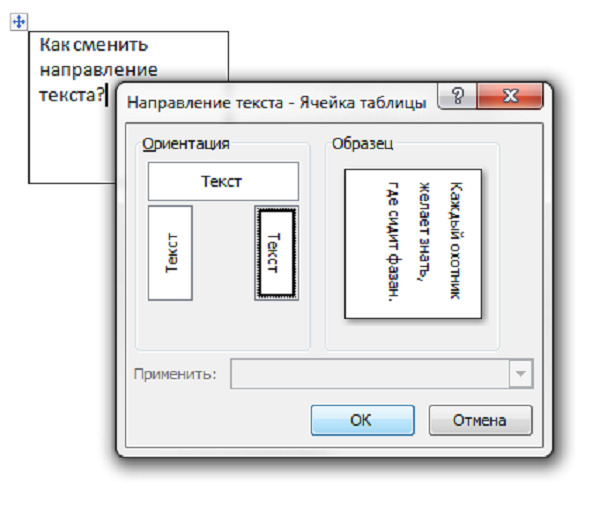 Enter in a table cell text and open its context menu "Work with tables" on the tab "Layout". Under "Alignment" select the desired text direction using the button "text Direction". Hide table borders.